Tony has Moved to Nam (Namibia) and is battling it out in Windhoek spearheading a new Band of misfits in his musical quest! 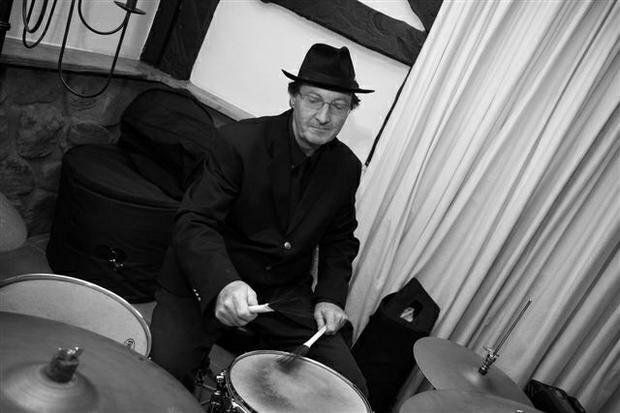 We now operate with a rotating set of Drummers but mostly feature the able Mr Roy McEwen on the skins. Tony Muirhead started playing drums at the age of 4 and was fortunate to be at a school where he could play in the Brass band and the Pipe band. Tony bought his first whole drum set when he was 16 and payed it off by drumming for school concerts. It was a heady time in the 70’s when Tony played for various upstarts and cover bands in those good old days. Always keen on jazz he went to Gene Latimer for training and that proved to be the base for his easy rhythmic style of playing. Tony got married at the age of 24 and stopped drumming to do the family duty thing with children until they were in high school when the urge was simply to much and he bought another kit and started all over again at the age of 38. Tony went to Mike Mozzoni for 2 years to brush up and re-learn forgotten skills. Soon he was recognized and was asked to play for Wills Blues band. A Chicago blues outfit well known in Durban. Bobby and the Dynamites, also an old Durban known blues outfit, soon introduced Tony to their fold as well. Another well known Durban man was Richard Walne who asked Tony to play in a set up called Jazz Juke box. The main swing back to Jazz was with pianist John Drake and bassist John Corlett. Tony met up with Daniel, Gerald and Logan for an afternoon function and there was instant magic with the group which is now Beat-Route. To add to that Tony has done session work with many professional outfits over the years.